Try Continuous Ink System with your Epson WorkForce WF-2530WF0 and make 30 times more quality prints for the same money! Pay only 0.04 USD for A-4 full color print! Print more, pay less! Profitable inkjet printing comes real with CISS Epson Workforce WF-2530WF! This system cardinally reduces and at the same time saves the printing quality at the highest possible quality level. Epson Workforce WF-2530WF CISS for substitutes the original ones rather well. Presented device allows saving large amount on printing. The cost of each copy is reduced dozens of times. Printing volume reaches 100 000 copies. It's easy to calculate how soon you purchase is worth it. Order CISS for Epson Workforce WF-2530WF on our resource is easy and very fast without any efforts. In our online shop you can also acquire CISS Epson WorkForce WF-3010DW at a lower price. System is made to give reliability of printing. bulk ink system for Epson Workforce WF-2530WF is hermetic; the assembly is performed the best way. 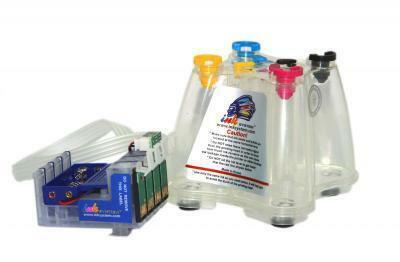 In addition, there is no need to change interior tanks; therefore the printing head is protected against getting air. Thereby, an owner is protected against the risk that this main component of MFD will break down and appear a lot of problems to repair it.